In a Montessori classroom you will often hear about the immense importance of developing each child’s fine motor skills. The topic of pencil grip, tracing and writing comes up frequently when parents and teachers chat, and why wouldn’t it? It is an important skill to learn! What is spoken about less often, but holds just as great an importance, is the value of the child developing their gross motor (large movement) skills. At school, the development of gross motor skills is woven seamlessly into works that are in the classroom as well as outdoor play time. In a Montessori classroom, it can be seen most prominently when the children are participating in a work called walking on the line. Walking on the line involves the child moving on a circular line of tape on the floor of the classroom. On this line, the options for movement are endless! Children are often seen hopping, skipping, or jumping. They balance balls on spoons, bean bags on their heads or walk on their tiptoes, all of which improve their balance, hand eye coordination and muscle strength. At home, developing gross motor skills can be as simple as encouraging your child to play outside, climb, explore or toss a ball around. You can also set up your own “line” at home by placing masking tape on the ground in a large circular pattern. Strategically place some balancing activities such as balls or bean bags nearby and watch your kids use their imagination while expending some energy on these cold winter days. The options are endless! Below are four reasons why developing your child’s gross motor skills, specifically from the ages of 0-6, is so important. As adults, we often don’t think about what our body endures each day. We have decades of experience in using our bodies! Sitting at a desk for hours a day involves using your ab and back muscles so you don’t feel strained. Working in a different industries may involve bending, squatting, standing or lifting, activities that use muscles throughout your entire body. What would you do if you couldn’t perform the basic movements you needed to do your job? This same mindset applies to our children. Their bodies and muscles are less used to simple activities such as sitting, standing or moving for long periods of times. The child’s muscles are still learning how to execute these large movements and how to do so day after day. That is why it is so important to expose them to gross motor activities starting from a very young age! If a child begins to get sore after sitting for 30 minutes, kindergarten or first grade will be a much harder transition when they make the move from an environment that focuses on freedom of movement to a more desk oriented environment. If the child is unaware of how they should move their body in a tight space, they may find themselves bumping into everything around them. The importance of building up this muscle strength flows into every facet of the child’s life and will make everything from walking, to organized sports, much easier. As humans, we use our fine motor skills countless times on a daily basis. From opening a cereal box to unscrewing the milk cap, from removing a credit card from our wallet to putting the straw in our caffeinated drink, it is difficult to get through a few hours without realizing just how critical your fine motor skills are to complete your day to day tasks. But what may be less obvious is that the continued development of your child’s gross motor skills is also critical to helping them further develop their fine motor skills. By perfecting the big movements, the child is now able to better focus on perfecting the little movements. By perfecting the ability to sit at a table, they are given the precious gift of being able to focus on how it feels to hold a pencil or trace a letter because they no longer need to focus on how to stay in their chair. Most of us can probably remember a time when we fell flat on our face, threw an air ball or otherwise pulled a move that is not in our daily repertoire. While children typically experience these types of situations on a much more frequent basis as they all are learning to better control their movements, how great would it be if they could, at a minimum, simply feel comfortable in their own bodies? We aren’t saying your child has to be the star of the soccer team because of their gross motor skills, but how great would it be if they could simply enjoy the activity they were doing, and make some new friends, because their focus was on the experience rather than the movement? This is not something that happens overnight, in fact, this takes practice well into elementary school, but by developing the child’s gross motor skills at a young age, they are able to approach basic tasks with much more confidence in their body and the way it moves. 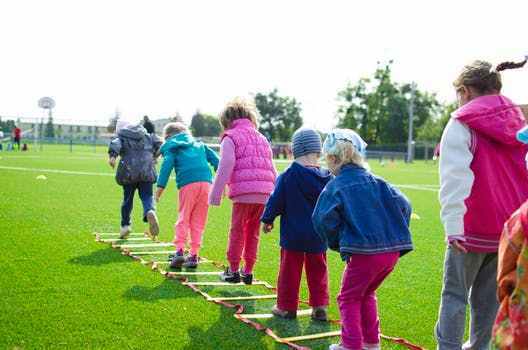 Last, but certainly not least, by working on gross motor development in school and at home, the child is able to start forming a strong foundation for a healthy lifestyle. Today, one in three American kids and teens is overweight or obese. This figure has more than tripled since the 70’s! Gross motor play not only keeps kids social, but it keeps them active, and fostering a love of movement from an early age helps the child discover that movement is FUN! Which means getting them up off the couch in ten years may just be a bit less of a struggle. Looking for some gross motor activities you can do during winter in Minnesota? Check out this link from Day 2 Day Parenting for great ideas for all ages!